Website loading Speed at PHPixie is an important criterion of a website’s success. First and foremost the acceleration of a site automatically increases its conversion. And it directly helps improve the main business objective of a website which is to generate more leads and more sales. Studies show that when a site is accelerated by only 100 milliseconds, the conversion gets increased by 5%. By 2.4% on desktop devices and by 7.1% on mobile devices. Acceleration by 1 second increases the conversion rate by 20%. Acceleration by 2 seconds increases conversion by 30%. Moreover, there is an additional advantage. Speed of PHPixie is directly related to behavioral factors that adversely affect the ranking of a website in search results. If you increase the download speed of PHPixie, this will reduce the probability of failure, visitors will perceive the site more positively, they will spend more time on your website. All of this will be highly estimated by search engines in their score results. By optimizing the images it is possible to significantly reduce the total amount of data (in bytes) that is loaded on the page. For example, total page size is reduced to 2 MB from 20 MB. Page capacity of 2 MB will load much faster than the previous version of the page with a volume of 20 MB. This is exactly how PHPixie download is accelerated. Our service allows you to automate routine and labor-intensive task of compressing and optimizing images. The connection to the website takes literally 2 minutes. And everything works automatically - all you need is to configure compression settings only once. 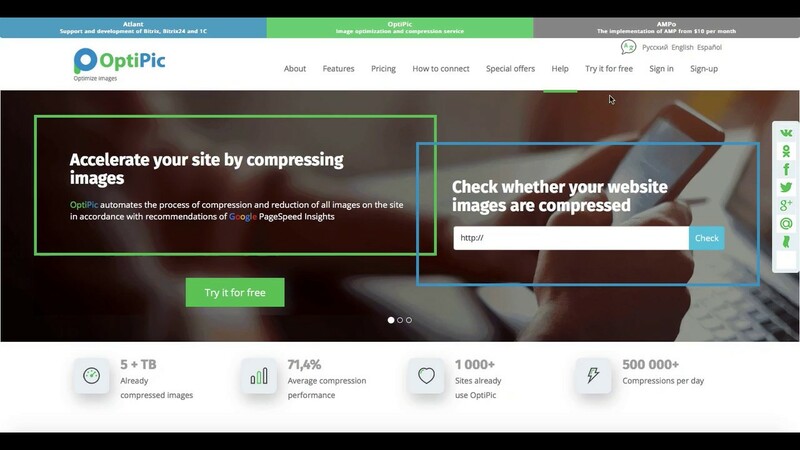 How to get started with OptiPic service for PHPixie for image compression? Caching of static files on the server side (images, css, js). Transferring css and js to the bottom of the html code page. Disabling unnecessary scripts and widgets. Optimization of web server settings (apache, nginx, php-fpm). Optimize the settings for mysql (or another sub-site that the site uses). Caching queries against third-party APIs. Refactoring and optimization of php-code logic. The OptiPic experts know all the subtleties of acceleration and are ready to tackle the complex acceleration of your site. Contact us if you need the maximum acceleration of your site.